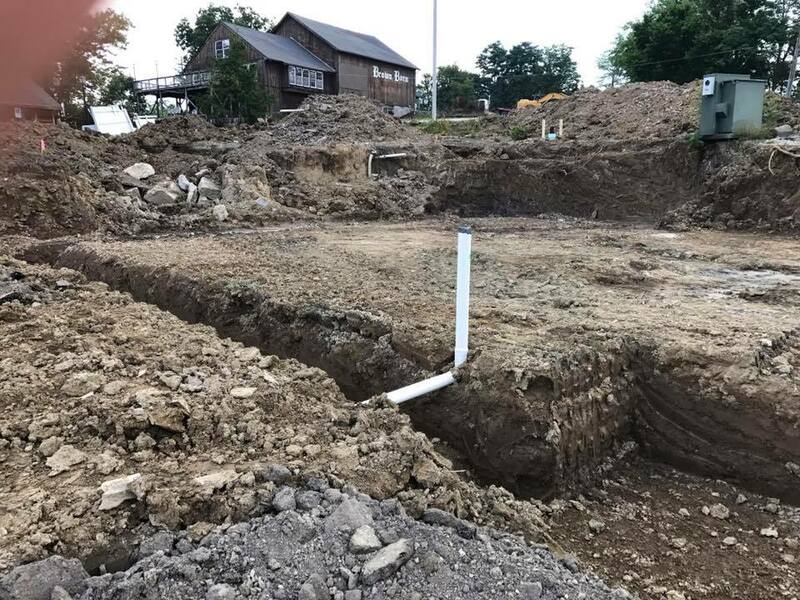 Munson Township- Three local businesses are working together to build a new chapter for the iconic Brown Barn and Fowlers Mills Inn & Restaurant in Munson Township. The property, located in the Fowlers Mill Historic District, overlooks Alpine Valley Ski Resort and has been a dining destination for decades. Todd and Susan Petersen, of Petersen & Petersen Attorneys at Law are moving their firm from Chardon to the Fowlers Mill Inn and Tavern location, where they will be joined by Todd’s father, Jerry. After studying the costs to renovate the restaurant building, it became clear that the deterioration was cost prohibitive. As a result, they will be constructing a new building in its place. Demolition of the restaurant took place in late May and construction of the new building is now beginning. “We can’t wait. After bringing my father on board earlier this year, we’ve been focused on taking the next step in growing Petersen & Petersen. Part of that process is providing a first-class facility for our staff and our clients. The fact we can do that while turning around a property so central to Munson Township makes it even better,” said Todd Petersen. The law office will be two floors of the building. Three office suites on the ground floor will be available for lease in early 2018. The Brown Barn, used for a variety of past businesses including a furniture store, a western bar, and a party center, will soon be updated to house a new local restaurant. Greg Higham, owner of local favorite Maple City Taps in Chardon, chose the building to grow his business and expand his food offerings. “Taps has earned a strong following with great food, reasonable prices, and fun atmosphere”, says Higham, “This second location will enable us to offer a menu to complement Taps and provide more dining options for our customers. Each location will have its own atmosphere, but will maintain the quality and service that has earned us this opportunity. The open layout of the Brown Barn and the views over Alpine Valley will make for a really unique, laid-back atmosphere.” Construction on the Brown Barn is expected to begin in July and Higham is targeting a late 2017 opening.